I practiced some launches on a certified local drag strip (County Road 800S to be precise ) and I'm aching to get it down the 1/4. I have a question about traction. Note that I have 235s and a 2wd. I currently have several hundred pounds of concrete hog slats (400-500 lbs if I were to guess). Are these giving me traction or weighing me down? What do those with drag racing experience think about this? Clean your bed out and only add the ballast you need (200 or so pounds) right at the tail gate. 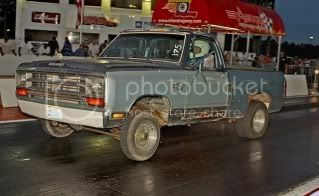 FWIW, my old 2wd 93 could hook decent (5-10psi before doing a burnout) on the street with 255 MT. Once at the track a couple days later, it wouldn't hold more than 5psi. Otherwise I would flat foot it once the bottom bulb lit. Being an auto, there wasn't much of a time difference. At lunch I took the hog slats out of the bed of my truck and took the long way home. Long story short, I need some weight back there. I have to reconfigure some things since my slats are 6' long and they won't fit side to side. I know where some almost bald 285s are (prime for drag racing), but that's getting pretty serious and will just result in finding the weak link. I'd rather not do that. Not really. Better than 235's but not enough to break something. Especially being 2wd. Heck, I do 3500 rpm clutch dumps in 4wd and have yet to break anything. I also have 33x12.5's which is almost equal to a 285/75. 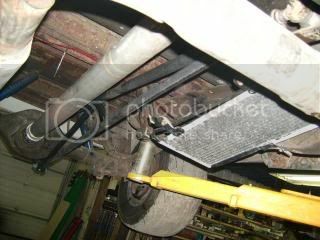 It is true that I have a pretty efficient driveline sponge living behind the engine. My dragstri experience was similar to Jon's, in that I could marginally hook up on the street launching in 2wd (no front DS for a while), but once I hit the track it was like a sheet of ice. If you've got no locker on a legit track, put the weight against the back on the spinning tire's side and pray. I was told don't let them wet the burnout box. The tires pick up the water, and while you are sitting on the line the water runs down under the tire. Spin city! If they let you drive around it, DO IT! If you have a posi and want to be a crowd pleaser, go ahead and drive right through it. The announcer and crowd were going nuts when I did a 100mph burnout like a dragster. The guy at the lights wasn't pleased but the announcer loved it. I think the announcer wins though, he owned the track. Yea, I'd stay away from water. Now that I think about it, I had all my weight on the passenger side (the side that tends to spin) originally when I had what I thought was a good launch. It's just spinning through 1 without weight. It comes on pretty good half way through 2 and through 3. I need to put together a transmission worth its salt too Hitting the stall on the converter feels good, but I wish it was sooner. I'd hang weight off the back. A buddy of mine took 1-1.5" plate and hung it from his tow package, and he spanned it across form frame rail to frame rail. It was all bolted on, so there was no welding. If it were me I'd do something similar. But I'd bolt it to the bed that way it would be easier to remove. I've seen old el caminos with lead ballasts that wrap the fenderwell in the bed. And I've also found that stock converter autos and long burnouts don't = as hard a launch and pull. Especially on hot days. Thres no reason for a big burnout with street tires. They just get greasy and slip more. Maybe turn it a couple times to dust it off and quit. Drive around the waterbox. You can also play with tire pressure to lower the wheel spin. The thing is, I'm not all that serious about this. It's just for fun. I can't loose leaves in the springs or do any suspension mods because this truck works. I'm not against traction bars, but I don't think I need them. It's just fun racing. cmann250 wrote: The loss was due to shifting into Neutral. Been there, done that . .. . . . a couple a times or so. 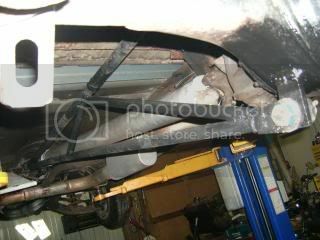 Sutter1stgen wrote: And I've also found that stock converter autos and long burnouts don't = as hard a launch and pull. Especially on hot days. This. Aftermarket converters as well. Hot trans fluid is thinner than cold fluid. A cooler fluid will result in a somewhat "tighter" converter. If you hold the brakes and build boost to launch, DO NOT be the first to fully stage, build boost first thing and hold it while your opponent . . .gets around to it. You'll heat the fluid very quickly and you will go slower. A lot slower. - Get pre-staged and wait for the other guy to do the same. Let him fully stage and you THEN quickly build boost to your launch figure, creep forward to fully stage (don't be slow doing this). Launch just before half-way through the third light.